My mom got into town yesterday — always a wonderful break in our routine. She’s an avid garden lover, so I decided to take her and MJ to the L.A. Arboretum for a couple of hours this morning. Good choice. 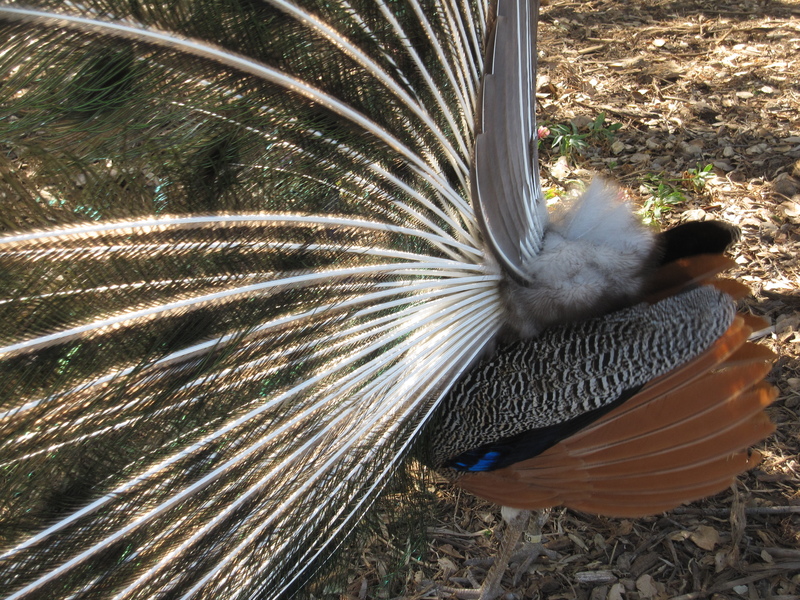 Not only did we get to see a male peacock with his feathers fully fanned out — a breathtaking sight — but everything else there was resplendent, as well. Apparently anything with flowers on it is in full bloom right now. And the weather couldn’t have been better. Finally, there was a lot less birdshit than last time. I don’t mean to be crude. But when you have a thousand large fowls on one hundred and twenty seven acres of land, you can be looking at a lot of slippery spots. Today it wasn’t so bad, though. The guy kneeling behind the peacock was obsessed with photographing its rear. You never think about what it looks like from behind, do you? Well, apparently he does. Me, I’m fine with just staring at the front. Honestly, it’s the most gorgeous yet impractical getup imaginable. How peacocks have survived the game of evolutionary roulette is anyone’s guess. Although one could say the same of any woman in stiletto heels, I suppose. 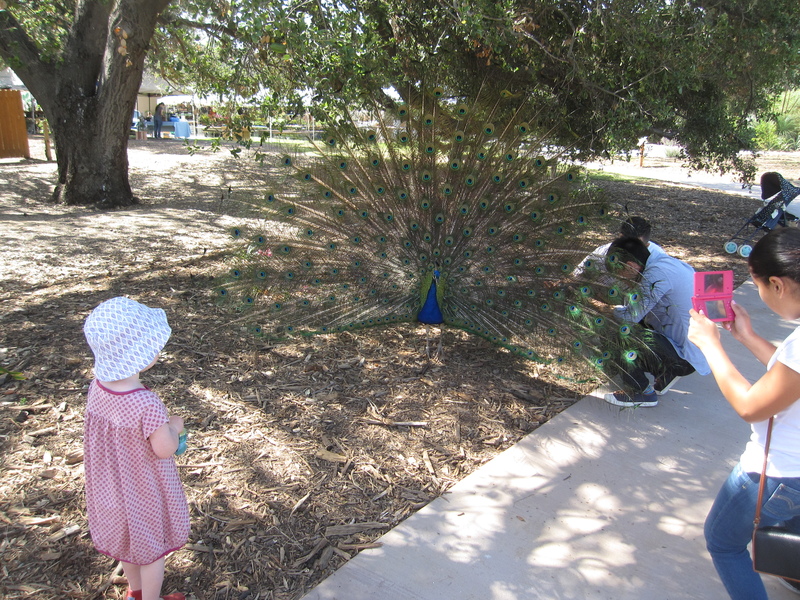 Anyway, there weren’t just peacocks. You had your ducks, your turtles, your red-tailed hawks, and your geese. The latter of which — unlike last time — refrained from trying to steal an almond-butter and jelly sandwich straight out of my daughter’s mucky little hands. Best of all? 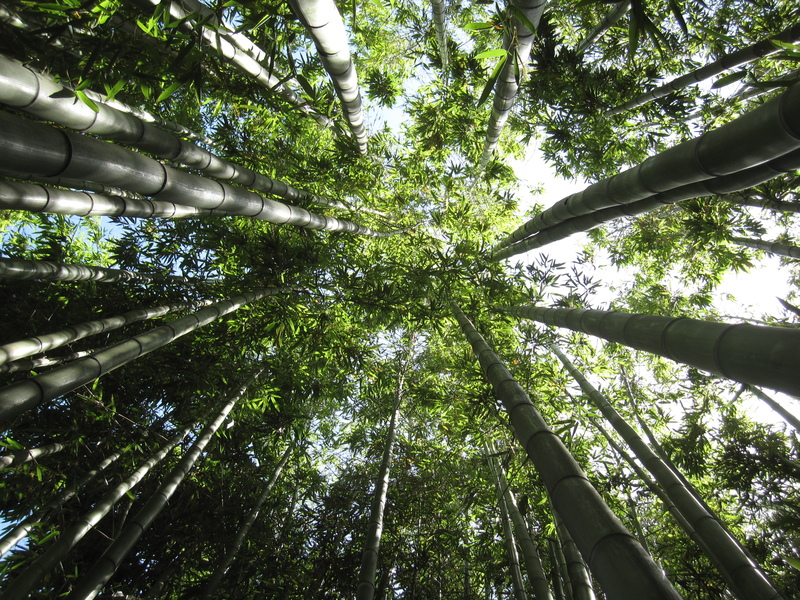 The bamboo grove. A nice place to take pictures, a nice place to get lost. And a super nice place to look up, up, up. One thing: MJ found a couple of feathers there — I think they’re duck — and insisted on bringing them home. Being of the urban, paranoid, and germaphobic ilk, I am convinced these plumes are covered with parasites, drug-resistant germs, and several strains of avian flu. Since the second she picked them up I have had to fight the impulse to yank them violently out of her hands, scream “dirty!” and throw them into the nearest incinerator. Right after I finish scouring her befouled hands with industrial-strength bleach. Ahem. The more benevolent, nature-embracing part of me thinks I should lighten up and let her keep them. After all, I had a hawk feather when I was a kid. I loved it. I stroked my face with it constantly. I’m still here. Sort of. 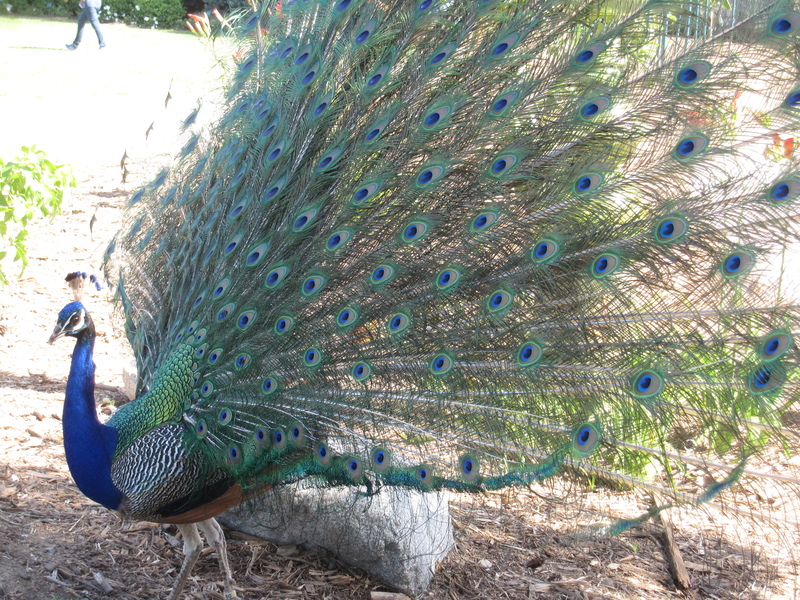 This entry was posted in Outings and tagged baldwin family, los angeles arboretum, peacocks on June 8, 2012 by thumbstumbler.